The Wall Street Journal published a great article this week called: Shockingly Good Smartphones You Can Get for $350 or Less (WSJ -Paywall). It makes a point that we tend to think of first-run phones as being $1000. But that there is a variety of Mid-Priced phones that are pretty effective. The main recommendation is Nokia 7.1 which happens to be one of my favorite phones. As the Article points out, it is a good modern phone running Android Oreo 8.1, with a nice screen, good camera and is pretty free of the bloatware that comes on Android devices. The other featured phones in the article are the Lenovo Moto G7, and the Xiaomi Pocophone F1. 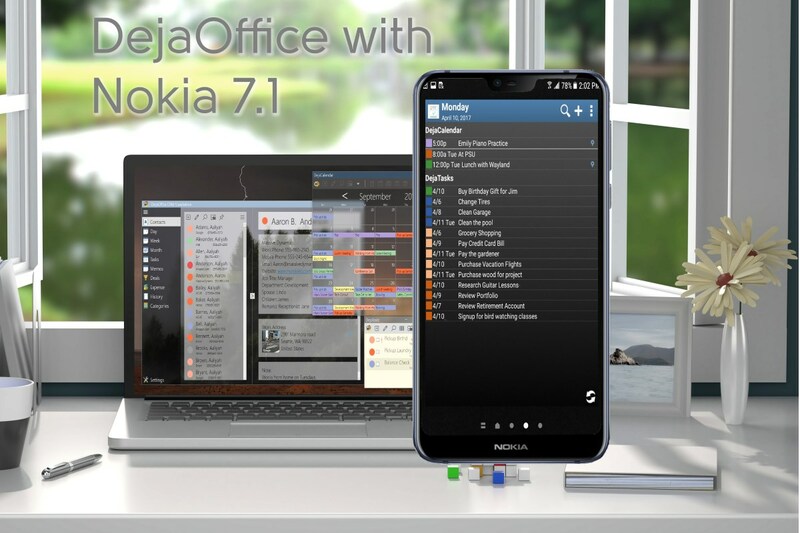 For all the mid-range phones, you can download DejaOffice from the Android App Store, and easily set up CompanionLink for Outlook to synchronize Outlook to the phone. DejaOffice for Android features widgets for the Android home screen to show your calendar, Category colors on Calendar, and integrated Tasks and Contacts so your whole work desktop is in one place on your phone. It’s great to see Nokia is back to making great main stream phones again!